Governments and development agencies are faced with the challenge of selecting the most effective interventions – nutrition-specific as well as nutrition-sensitive – to help achieve the ambitious international development goal of improved nutrition for everyone. 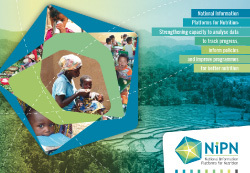 National Information Platforms for Nutrition (NIPN) is a global initiative providing support to countries to strengthen their information systems for nutrition and to improve the analysis of data so as to better inform the strategic decisions they are faced with to prevent malnutrition and its consequences. It is driven by the European Commission’s Directorate General for Cooperation and Development and it is also supported by the United Kingdom Department for International Development and the Bill & Melinda Gates Foundation. The NIPN initiative is designed to support countries in the Scaling Up Nutrition (SUN) movement to strengthen their capacity to bring together existing information on nutritional status with information on factors that influence nutritional outcomes, including policies, programmes and investments, in order to track progress towards international global targets; to analyse data to understand better how malnutrition can be prevented; and to inform national policies and improve programmes. The initiative currently involves Bangladesh, Ethiopia, Kenya, Laos, Niger and Uganda, but other countries will join. A Global Support Facility (GSF) has been set up to support each country to develop a National Information Platform for Nutrition and to coordinate the technical support and capacity building required. An Expert Advisory Group has also been constituted to provide technical guidance and advice throughout the project. disseminate findings and evidence to policy makers and programme planners.